The Personnel Scheduling and Communication System for Law Enforcement. See how it works and get all your questions answered with a FREE live, online demonstration of PlanIt Police. I have used several scheduling programs in those years. By far, nothing has been as exceptional as this. I am beyond thrilled with the caliber of the program, employees, and customer service. 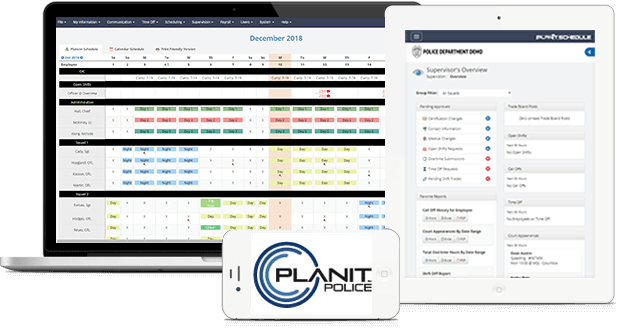 PlanIt Police is available to all members of your department from any device with an internet connection using their favorite web browser or with our mobile app for iOS or Android. PlanIt is located within the largest cloud hosting provider located within the United States to ensure a fast and always available connection. Eliminate your scheduling spreadsheets. Stop printing paper schedules. Move on from slow and complicated scheduling products that haven’t been updated in years. It’s time to use a modern scheduling solution designed for Police Departments. The PlanIt Team is headed to the sweetest place on earth for the CODY Connect Conference. Stop by our table Wednesday night and Thursday during the day to say hello and checkout our new look. The PlanIt team will be at the NJSACOP Mid-Year Meeting to demonstrate PlanIt. To our customers in the Carolinas facing Hurricane Florence.